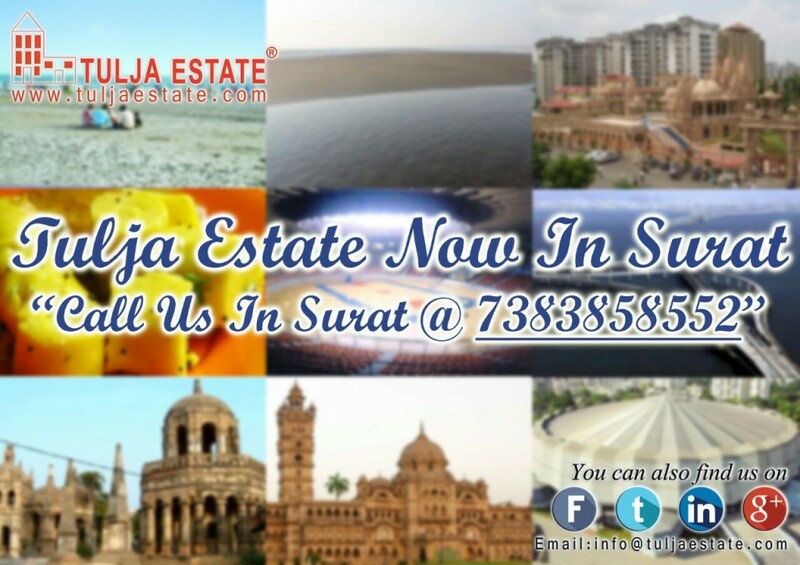 TULJA ESTATE NOW IMPOSING A BENCHMARK SIGNATURE OF SUCCESS AT SURAT - Tulja Estate Pvt Ltd.
Tulja Estate Pvt. Ltd. is now in Surat @ Ghoddod Road. This is a jubilant and an upbeat celebration cut of moment once again for Tulja Estate Pvt. Ltd. We are elated to share the news for our next location in Surat, Gujarat which is marked with a nickname as diamond city of India with our chain of supportive and satisfied section of clients. Surat which is considered at present as the 34th largest city by area and 4th fastest developing cities, is a forthcoming and most notable milepost for investment purpose. We hope that our assistance, utility services, valuable guidance and work will prove us once again as one of the most renowned and trustful real estate firm in this new locale. For further more queries in Surat region, you can get in touch with us by calling on 7383858552. You can also feel free to get in touch by another source i.e visiting our official website so as to drop your personal queries and suggestions 24×7. We always look forward to your given valuable comments for making us best from better each day.